This meeting is designed to assist players who wish to play college soccer. We will help them create a highlight tape, write introductory emails and answer any other questions they might have about the college process. All players should bring paper, pen, laptop (if they have it), and their top 30 list of colleges that they are interested in. Sporting San Diego has partnered with the City of La Mesa and West Coast Arborists with a goal to plant 200 tress in the La Mesa. The first step for this massive project is to join us for our workshop on August 24th at the Adult Enrichment Center in La Mesa. During this workshop all will learn about the tree plating process, arbor history facts, post plating care, and much more. For anyone interested in attending our workshop please email info@sportingsd.com. Sporting San Diego will have the privledge of having Jason Entlich work with our teams and coaches for three days in March. Coach Entlich brings a wealth of knowledge and experience from the soccer world. Entering his 15th season at Columbus State in the fall of 2018, Entlich is the winningest coach in PBC history posting a 241-55-22 mark since 2004. In his tenure, the Lady Cougars have captured at least a share of the PBC regular season championship 11 times and have won the PBC Tournament seven times. In addition, CSU has appeared in the PBC Tournament finals 11 times in the past 13 seasons. Columbus State is also no stranger to the NCAA Tournament under Entlich having made 12 straight appearances. Since 2007, the Lady Cougars have advanced to at least the second round of the NCAA Tournament in every year including making national quarterfinal appearances in 2007, 2008, 2015 and 2016. In 2015, the Lady Cougars made their deepest NCAA Tournament run, advancing to the national championship game and followed it up with an appearance in the national semifinals in 2016. Prior to coming to Columbus State University, Entlich served as the head coach of the Carolina Courage of the Women’s United Soccer Association. Among the players he coached were 2004 FIFA World Soccer Player of the Year Birgit Prinz and World Cup players Kristen Luckenbill, Tiffany Roberts, Carla Overbeck and Danielle Fotopoulos. Before the Courage, Entlich was a U.S. Women’s National Team staff coach where he coordinated player development, indentified and recruited players for the U.S Youth National Teams and instructed B and C license courses for coaches. We look forward to the visit and cannot wait to soak up all the information that we can. Come and check out what Sporting San Diego has to offer. We look forward to seeing all new and returning players! Sporting San Diego Try Out dates for boys and girls 2012 - 2005. All new and returning players must register through our link in order to participate in the try out process. Come and check out what Sporting San Diego has to offer. These series of free clinics will allow parents and players to meet our staff and see how our coaches interact with players. Invite a friend, family member or a neighbor and enjoy a Friday night on the field with Sporting San Diego. Sporting San Diego in conjunction with our sponsor Dixieline Home and Lumber Centers will be hosting our Annual Toy Drive. All those interested in donating can drop off any unwrapped gift on the following day and location. If you have any questions about our Toy Drive or would like to help out please email info@sportingsd.com. On October 13th, 2018, from 5-10pm we will be holding our biggest fundraiser of the year, Baller Bonanza, at the La Mesa Recreation Center. The funds we raise directly benefit our boys and girls by providing scholarships to families who would otherwise not be able to take on the cost of their player’s registration (30% of our players receive scholarships). Your donation will also help provide skill clinics and equipment. We anticipate 200 to 400 local San Diego residents to attend this fun evening. We would appreciate your consideration of a donation to our event. It is only through the generous support of our soccer families and businesses in our community that we can be successful. All donors will receive recognition at the Sporting SD Dinner and Auction. We would also like to extend an invitation to you, to join us on the 13th of October for this great Youth Soccer fundraising event. Regular Season begins for all teams on Saturday September 8th. Coaches wills end out schedules once they are posted. 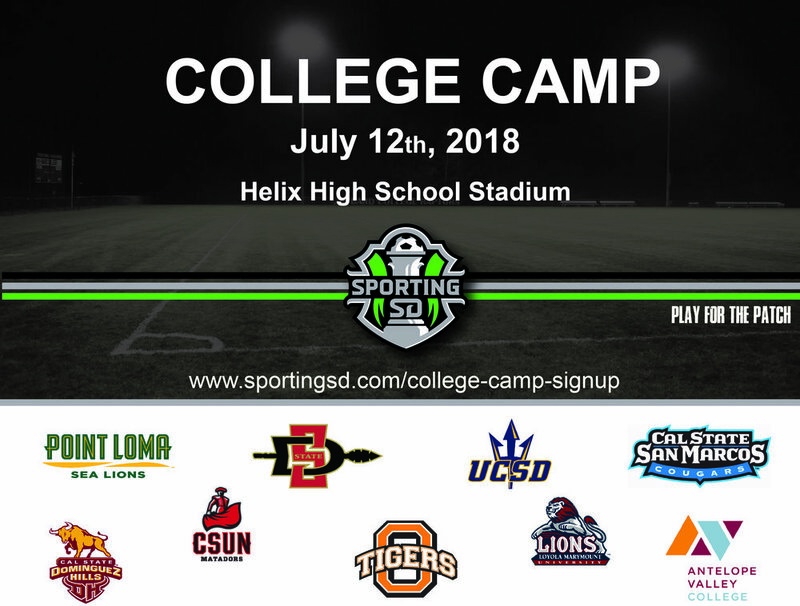 Sporting San Diego is excited to announce that we will be hosting our first annual tournamnt July 21st & 22nd of 2018. More details on Sporting San Diego Classic to come, stay tuned for venues, registration deadlines, and check-in deatils. Go Sporting! On June 30th we are planning to have a World Cup viewing in room 1300 at Helix High from 10:30am-1pm. This is the round of 16 so we do not know who is playing yet. This will be a great opportunity to have different players and parents come and get together as a club. The viewing will be free of charge. It’s a bring your own food and drinks event. We really hope that you can pass the message onto your players and parents, so they can join on that day. Wear your Sporting San Diego gear! " 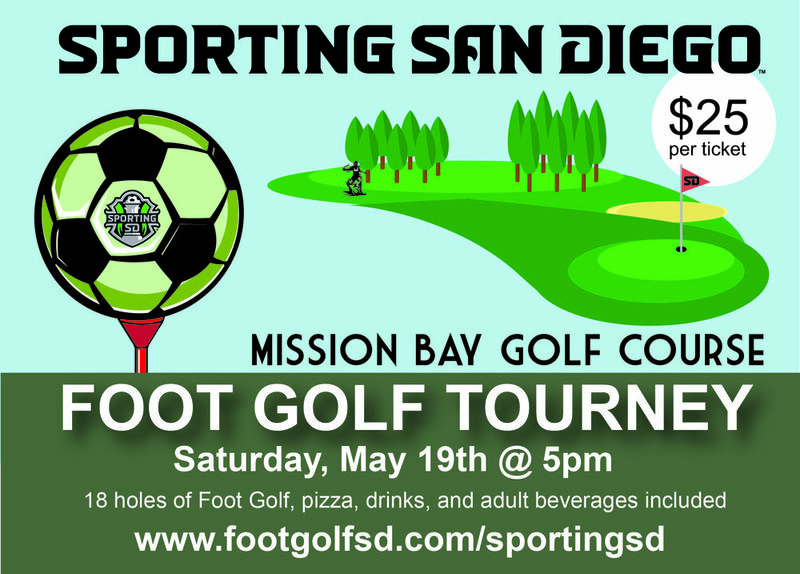 Sporting San Diego will host its annual Foot Golf Tournament at Mission Bay Golf Course on Saturday, May 19th. Food will be served at 5pm and kick off will be at 6pm. The $25 ticket purchase includes 18 holes, pizza, drinks and adult beverages. You will be playing in groups of four, if you sign up in a group smaller than four you will be assigned to a foursome with others. We look forward to a great event! 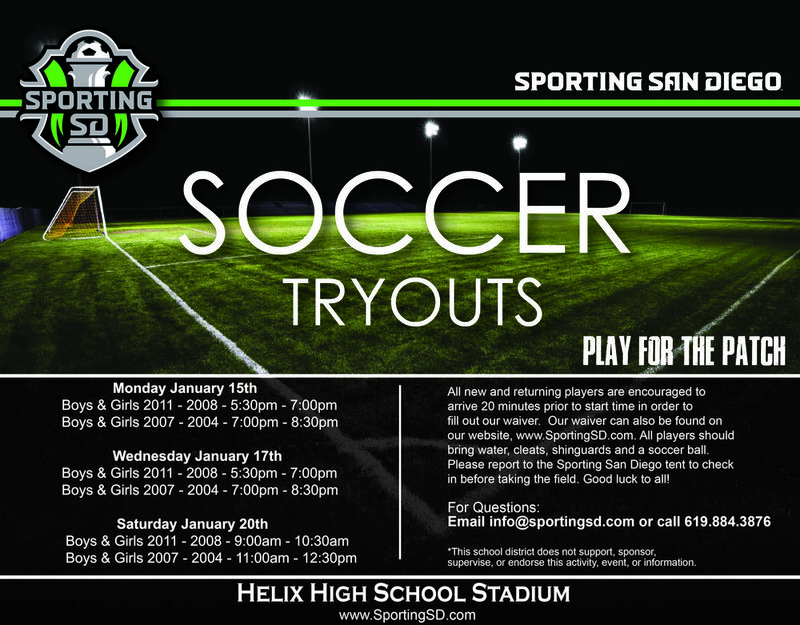 Tryouts for the age groups 2004 - 2000 will take place on March 24th & 25th in the Helix High School Stadium. Both tryout days will run from 1 - 3pm. All new and returning players must pre-register at www.SportingSD.com. Please email info@sportingsd.com with any questions. All new and returning players are encouraged to arrive 20 minutes prior to start time in order to fill out our waiver. Our waiver can also be found on our website, www. SportingSD.com. All players should bring water, cleats, shinguards, and a soccer ball. Please report to the Sporting San Diego tent to check in before taking the field. Good luck to all! Drop off your unwrapped gifts at Helix High School in the Stadium on December 7th. Sporting Staff will be there to collect any donations. Any donations are welcome and appreciated. Our goals is to reach 2,500 toys with our partners Dixieline Home and Lumber Center. Thank you in advance! 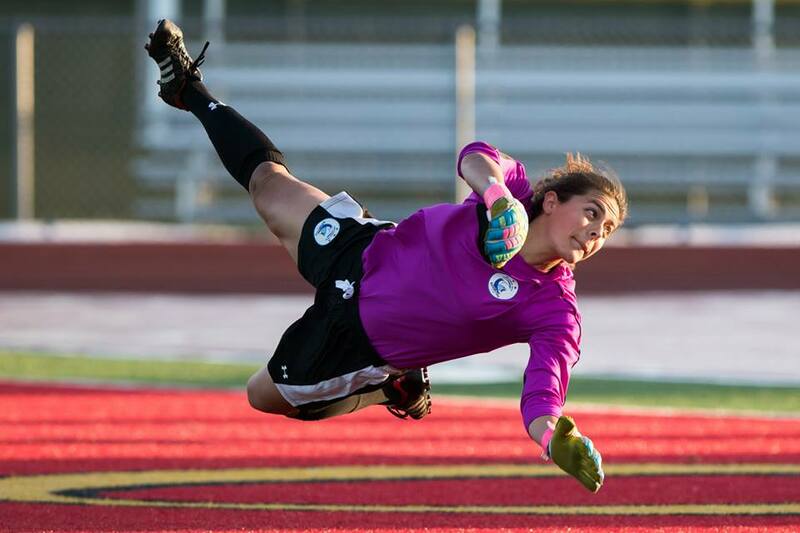 Keeper training every Thursday with Kaycee Gunion at Helix High School. Please contact her at kcgunion@gmail.com if you have any questions. It is that time of year again! We are partnering with our amazing sponsor, Dixieline Home and Lumber Centers, for our second annual toy drive. Last year’s results were amazing as we handed out thousands of toys to families that could use a little help during the holidays. From the onset, our tent was swarmed by smiling faces as they selected a toy to take home. There was only one problem…..we ran out of toys! We want to make sure this does not happen again this year and we really need the help of the Sporting San Diego family. We will be collecting unopened toys at all practices and at all Dixieline locations until December 4th, 2017. Please help us by bringing in as many unopened toys as possible so we can make sure every child goes home with a present. Our Sporting family always comes through and we are sure this event will be no different. Thanks again for your continued support and your participation in helping Sporting San Diego and Dixieline give back to the community! 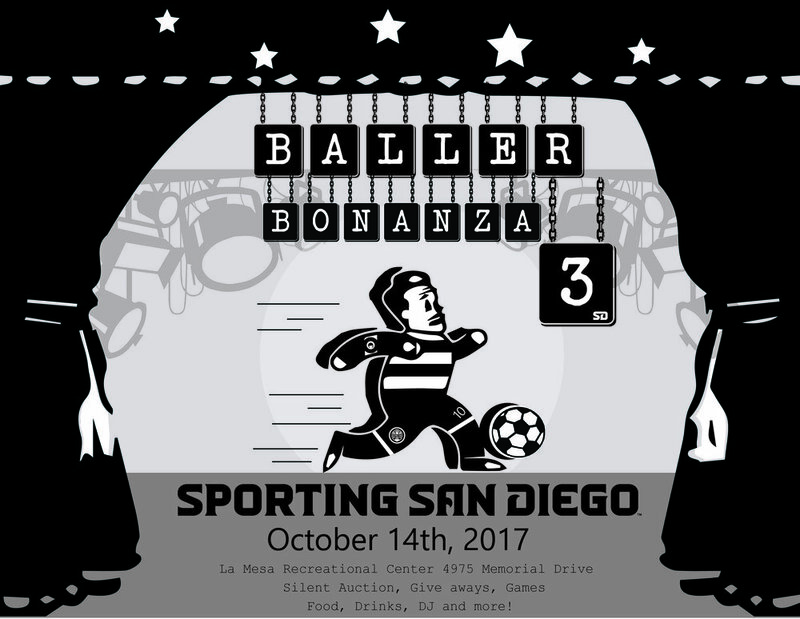 On October 14th, 2017 from 5-10pm., we will be holding our biggest fundraiser of the year, Baller Bonanza, at the La Mesa Recreation Center. The funds we raise directly benefit our boys and girls by providing scholarships to families who would otherwise not be able to take on the cost of their player’s registration (30% of our players receive scholarships). Your donation will also help provide skill clinics and equipment. We anticipate 200 to 400 local San Diego residents to attend this fun evening. We would appreciate your consideration of a donation to our event. It is only through the generous support of our soccer families and businesses in our community that we can be successful. All donors will receive recognition at the Sporting SD Dinner and Auction. We would also like to extend an invitation to you, to join us on the 14th of October for this great Youth Soccer fundraising event. During our college night this year we will introduce the college process to our players. We will go over the do's and don'ts of college recruiting as well as go over recruiting rules that schools, players and families must follow. We will have the players do a college search so they can narrow down the schools that they are interested in. This includes the size of the school they wish to attend, where they wish to attend, majors the school offers, and extracurriculars they want to be apart of. We will help players construct their college profiles as well as their letters if interest for college coaches. This is only the first step and we can not wait to help guide our players through the college process. This is a make up day only for those that missed the original date.